A promotional image of a Verizon Wireless branded Motorola RAZR MAXX has leaked, leading to speculation that a CDMA version of the handset is in the pipeline. The MAXX was announced back in June along with the KRZR and RIZR but there was no mention of a CDMA version at that time. Since the CDMA RAZR MAXX hasn't been officially announced, features cannot yet be confirmed. 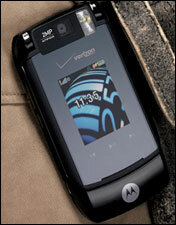 The GSM version sports a QVGA screen, microSD card slot, Bluetooth and 50MB memory. A 2-megapixel camera and touch sensitive music keys are shown in the leaked image. Since this is an unannounced product, there is no word on expected availability. We'll keep you posted.